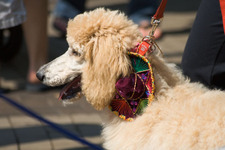 10 posts categorized "Discovering Philly"
I was a little surprised at myself that when I read about this Carnivale of the Dogs happening in Rittenhouse Square Park this weekend I actually wanted to go. I'm not really a dog person, so the thought of dogs parading around in costume... well, would I really go out of my way to see them? But I guess the photographer in me thought it had potential and the cook in me really wanted to stop by the Rittenhouse Square Park farmer's market. Unbelievably I was able to drag J along, probably because he was so excited that I was actually going to leave my computer and go outside into this city he's been dying to explore with me. Not that we haven't already been to Rittenhouse Square Park. But it is truly a rare occasion when I get him to agree to come vegetable shopping with me. So it must have been the dogs that pushed him over the edge. By the time we got to the park, we had missed the costume parade and awards ceremony that had been at noon, and in fact, most of the dogs we did see weren't in costume. There were t-shirts and bandanas here and there, and even this dog wearing a little Mexican hat around his neck, but for the most parts the dogs retained their diginity. I discovered that it's a little hard to photograph dogs without getting down on the ground at their level. And those guys move fast. I have a lot of photos that might have been cute if they would just stand still, but instead they came out as a blur running past. 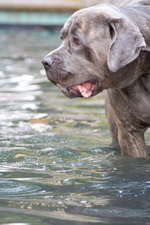 The easiest ones to take pictures of, and the most fun to watch for me, were the dogs jumping around in the fountain. 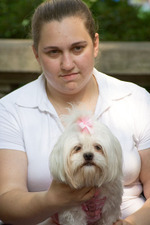 Then there were the dogs who were sitting for portraits. Did they know why they were sitting there? Did the ones in line know what they were in for? It's funny to me that dogs will do whatever is asked of them. Not that they care, I suppose, if someone draws a picture of them. This dog watched us on our way out. At the farmer's market I picked up some eggplant, tomatoes, purple peppers, and apples. When we came home, we snacked on the apples, and then for dinner the eggplant went into a very yummy green curry. So now today... more work. It's going to be a long week, but one that I'm actually looking forward to. I think I can get a lot done. Last night we went with some friends to Zocalo, which has a yummy sounding menu and a pretty decent Zagat review. But the food... booooorrrrring. I've had more interesting and better food for $8 an entree, and this cost $17-20 a plate. I had the shrimp with vegetables and rice, which was pretty uninteresting, except for the poblano peppers (because poblano peppers are always good), and J had the pork which ostensibly had a citrus marinade, though it was subtle at best. However, I will say that the dessert I shared with CC was good - it was a rice pudding with cinnamon and raisins in a waffle shell. If I had to go there again, I'd just get that for dinner. Then, while I was still sipping my lychee cocktail, J was eyeing the trees outside, which were starting to wave wildly back and forth. So cozy inside, I hardly noticed. Eventually J decided that rain was imminent and suggested we try to beat it home, so CC, J and I tried to run back to Center City (CC in her cute heels). As we walked, flashes of lighting cracked overhead, causing me to reach out once for CC's arm (I missed, and won't tell you where I actually grabbed). And once the crack of lightning was so loud that all three of us stopped in our tracks and crouched in preparation for whatever might fall on us, and then laughed at our reaction. It soon became apparent that we weren't going to make it back, but we managed to find a cab just as the first large raindrops came splashing down. Given the extent to which I was soaked just from running from the cab to our front door, I can only imagine how drenched I (and my camera) would have been had we walked home across the bridge. In between having a temporary parking sticker and getting our residential parking sticker, I had to move the car every two hours. I could have just gotten a third temporary parking sticker, but at $15 each, it was starting to add up and I rationalized that we were just a few days away from getting a residential pass and, anyway, I enjoyed the breaks from my work. But the city of Philadelphia is serious about ticketing. There is a guy who walks around my neighborhood all day long updating in a little notebook which non-permit cars are parked where. I wondered if he came to recognize me as I walked by every two hours and if he associated me with the Maryland car that he found on different streets every couple of hours. I wondered if he thought I was crazy for not getting a pass or if he was hopeful that I would be late once so that he could finally ticket the car. So I certainly eyed some of the side streets (the ones that look like alleyways), wondering if I would get ticketed if I just left the car there, off of the main streets. But there are signs warning against this, and given the ticket guy's constant presence, I decided it wasn't worth it. I did see other cars parked in these side streets though and assumed that they were the people who lived there, maybe parking a second car in front of their personal driveway. Or maybe they were visitors who didn't want to deal with the two hour rule of street parking. But I didn't pay much more attention until this morning, when down below my open window I heard a man yelling, "Stop parking there!" It struck me as such a strange sentence, his use of progressive tense when parking isn't really something I think of as an ongoing action. But he meant, of course, that the person had been parking there day after day. I didn't hear the driver yelling back, but the guy yelled about how he was sick of not being able to get out of his driveway. And then I heard a woman's voice, shaking with anger, almost teary (the way I get when I am angry and I am almost embarrassed when tears accompany my anger), also yelling about how she can never get out of her driveway either. Their frustration was very striking, since the person they were yelling at was obviously right there. They weren't yelling to cover distance, they were yelling because they were mad. Hm, did I forget to blog? I haven't had much to say for the past couple of days, really. I'm just writing my dissertation. Yes, my life is that exciting. Meanwhile, I was trapped inside the apartment, waiting for some cable that J had ordered and which was late in arriving. UPS left an attempted delivery notice yesterday, in spite of our being home all day, which makes us question whether they even rang the bell or perhaps whether it might be broken. They promised to redeliver it today, so I waited all day. I made the mistake of not showering before J left, which meant that I couldn't shower until either he got back or the cable arrived. And of course, it didn't show up until after J got back from work. And wouldn't you know, he'd ordered the wrong cable anyway so now he has to return it. Now that I've written this post about how horribly boring my day was, and probably put all of you to sleep just from reading about it, I'm thinking I really should have just written about the amazing Greek restaurant we went to on Friday night, Effie's. This time I got the best dish at the table. J's lamb skewers were relatively good but not fantastic, and C's pita looked pretty standard, but the moussaka was absolutely something to write home blog about. It was moist, but not overcooked, and had a lovely and strong hint of cinnamon. I was even thrilled not to be able to finish it because it just meant that I could have the second half of it for lunch the next day (and it was still just as good then). On a day so hot that there was a severe weather advisory (yesterday), J and I decided it would be the perfect time to traipse around downtown and run a few errands. Our first stop was to Pearle Vision for an eye exam and a contact lens refill for me. I knew the prescription from the cranky optometrist at Sears Optimal in Baltimore (Security Blvd) wasn't quite right, and today's optometrist agreed with me. But then I blew her mind by one of my eyes completely rejecting a contact which she was sure was the same in every way to the one I'd come in wearing except instead of calling it Biomedics (what they call it through 1-800-CONTACTS) they're called something else. The prescription for my right eye hadn't changed, so the only difference was the brand name on the box, but yet looking through the contact was an experience I'd never had before. Everything had sort of a glowy drop-shadow effect which bounced around whenever I blinked my eye. It was kind of cool, but also kind of disorienting, so I ended up having to switch brands and now I feel like I just applied an unsharp mask to the world. For lunch we stopped at Qdoba, which is suspiciously like a Chipotle, but doesn't actually seem to be related. And they have more variety - I got a poblano pesto burrito which was only ok, but J's mole sauce burrito was much more interesting. After lunch we walked into the shiny world of Verizon Wireless, and got a family share plan and two new phones. I had been due for a new-every-two phone for over a year, and J got his phone free since we were getting my phone. Originally, I was going to take the cheap free phone and let him pick out whatever fancy-schmancy phone he wanted, but in the end, all he wanted was a phone-phone (you know, one that makes calls and that's it) and so did I, but I got swayed by the 1.3 MP cameras on the more expensive phones. Truthfully, I am not really interested in a camera phone since there's no way it could ever compete with my camera and I have my camera with me almost all the time, but hey if it's going to have a camera on it, I'd rather have a 1.3 MP camera than a 300K one, right? So I ended up with the fancy-schmancy phone with V CAST and all that other stuff that I'm never going to use because you have to pay for it and I am too cheap to even pay to upgrade from the horrible default ring tones. But it's very a cute phone. I mean, I'm a little sorry to part with my old phone because it was my first cell phone, but it's three years old and the battery hardly lasts a whole day and now it doesn't even ring any more (occasionally it rings just at the last second, when it's too late to find the phone before it goes to voice mail). Anyway, I had talked J into a trip to Trader Joe's on the premise that we needed food in general, but really my secret goal was to pick up some of the deeeelectable ginger ice cream I had at ViSuaLLy MiNDeD's house this past week. It's got real ginger pieces in it, yet it's not as piercing as you might expect. And interestingly enough, it's really good when paired with coffee ice cream, so I picked up a pint of that as well. Today I'm headed outside again and it seems just as hot as yesterday, but it will be fun because I'm meeting up with one of my college roommates. Coincidentally, her sister is moving in about four blocks away from me. Given the number of people I know who live here, I'm starting to think that maybe Philly (and not NYC, as I previously thought) is the center of the universe... my universe anyway. :) And that's ok, because so far I'm really liking it here! Talk about brotherly love - this city is so friendly! Especially online. I was delighted to get comments on my very first post from some of the Philly bloggers I had been reading since before I moved here. And today one of my Flickr contacts suggested meeting up for a group photoshoot sometime. Anyway, I'm headed back to Baltimore this weekend for J's defense on Tuesday. (!!) Gotta plan a dinner for that, meet with my advisors, work... I think it's going to be a busy week, so don't be surprised if my recent bout of blogging subsides for a little bit. We just got back from seeing An Inconvenient Truth at the Ritz East, and yes I know that everyone and their mother has already seen it, but let me ask you, how many of you had Al Gore come to your theater and answer your questions for half an hour after the movie? Much of the movie was really depressing and scary. But I think that one of the most hopeful things I took away from the movie was that America contributes over 30% of the CO2 to the atmosphere, which on the face of it is just alarming, but that means that if we do something about it we can reduce a huge chunk of the problem. That's enormous power, and if America takes action, imagine the impact that would have on the rest of the world. And then, noticing the wind picking up outside, we had them box up the remainder of my meal, booked it out of the restaurant, and ran the 15 blocks home, only to get soaked by the rain during the last few blocks. * Update 7/19/06: That average burrito turned out to be really, really good when heated up for lunch. My parents came down this weekend to return our cats, bring the wedding gifts (yay, new dishes! ), and of course, to visit! My dad hasn't been here since he went to college here (1962-1967) (or at least, he hasn't been here recently), so it was fun to let him lead us around to his old dorm and his old frat house. After lunch, no one wanted to walk any more so we went back to the apartment and started looking through the wedding photos that ViSuaLLy MiNDeD, Chiaroscuro, and Mike had taken. All five DVDs. Eventually we are going to pull out some pictures for an album, but what a huge task that is going to be. I'm starting to think maybe we should have hired bad photographers, because then we'd just pick the best ones and be done with it. But what you do when they're all good?! And it's true, they are all really good. I really hope they had as much fun taking pictures as they say they did, because we have the best wedding pictures ever. Yesterday I combined a trip to the post office (J & L your stuff from Germany is on its way!) with a little loop around Center City with my camera. It was really hot out, but the lighting was perfect (not too harsh), so I was happy. In other photo-related news, I got an email from someone in Israel who wants to use one of my photos on a book cover. On the advice of Chiaroscuro who recently had one of her photos used on a book cover, I asked whether she or her agency has a photography budget, but alas this will just be a self-published poetry book. So I won't get paid, but I will get a photo credit and a free copy of the book. Welcome to my new blog, PhiLLY RoLL, previously known as BaLtiMoRe RoLL. We moved to Philly (from Baltimore, obviously) on July 5th, will be starting new jobs soon, and I'm even changing my last name (just got married), so naturally my blog needed to be updated too. I get three blogs with my Typepad subscription, so I am able to keep BaLtiMoRe RoLL up at its old URL and start PhiLLY RoLL anew with minimal, minimal work. 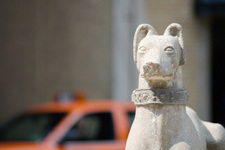 All of my old Baltimore and friends links transferred over, and I've even got some Philly links up on the sidebar already, ones that I have been reading for a while but hadn't yet added to my sidebar. So we've been here in Philly for six days now. It feels very surreal, almost like we are traveling, rather than having moved. This is probably because both J and I are hard at work finishing up our dissertations (in fact, he's actually in Baltimore right now turning in yet another draft), so that is really taking priority over moving in. In the meantime, we are living out of our suitcases and we've made some quick runs to the grocery store. It's too bad we've been so busy because our new apartment is phenomenal - it's got 15-foot ceilings, big rooms, giant windows with lots of light, a dishwasher and garbage disposal, and lovely wood floors. It will be nice to get settled in and make this look like home. I also feel like we're traveling because our neighborhood in Center City appears very European to me, with its tree-lined streets, flower boxes and little gardens wherever possible, cute little alleyways with old posts for tying up your horse, etc. And then, of course, there's the wonderful convenience of living in the city. Down the street is a butcher, around the corner are two gourmet shops, across the street is an adorable park with animal sculptures and a fountain, on the other side of the park there's a Greek restaurant, up the street there's a gourmet pizza restaurant (which we went to last time we were here and it's excellent)... and this is all within about four blocks of our apartment.